Regional lymph node metastasis is the most reliable and definitive predictor of treatment outcomes for patients with histological proven head and neck squamous cell carcinoma (HNSCC)., A few previous studies hypothesized that pathologic lymph node staging (pN) would be a more reliable predictor of treatment outcomes than clinical lymph node staging (cN). Tumor node metastasis (TNM) staging systems are formulated to compare similarly staged patients, facilitate prognosis, and provide useful information for treatment management. They are used to quantify patients for therapeutic interventions and comparisons of outcomes across populations. Current American Joint Committee on Cancer (AJCC) lymph node staging guidelines of oral cavity cancers are based on the clinical evaluation of size of the lymph node, the number of lymph nodes, and the presence of contralateral or bilateral regional disease., However, this is a clinical staging system that does not incorporate any pathological information. The purpose of the current retrospective study is to review all patients with HNSCC at a single cancer center treated surgically, including an elective neck dissection, to assess whether pathologic lymph node status is more reliable than clinical lymph node stage in predicting treatment outcomes. This is a retrospective analysis of 169 head and neck cancer patients from January 1, 2015, to December 31, 2015, reporting to Indian Institute of head and neck oncology, Rau, Indore, Madhya Pradesh. There were 543 body malignancies. Out of these, 169 head and neck cancer patients and 97 patients were operated. Records of 87 patients were available and hence included in this study. The remaining ten patients were excluded from the study for the nonavailability of correct data. Clinical TNM staging was collected based on the clinical examination and radiological examination (ultrasonography [USG] – neck) of all 87 patients. All patients underwent elective neck dissection and histopathological reports were followed on 4th day of the surgery. Pathological TNM staging was collected based on the report, and cTNM and pTNM of all 87 patients were compared and tabulated. A total of 169 patients had head and neck cancer out of 543 total body malignancies. From these 169 patients, 97 patients were operated. A retrospective analysis of these 87 patients was done to find the incidence of upstaging of the disease. In these 87 operated patients, 26 patients had upstaging based on nodal status histopathologically. 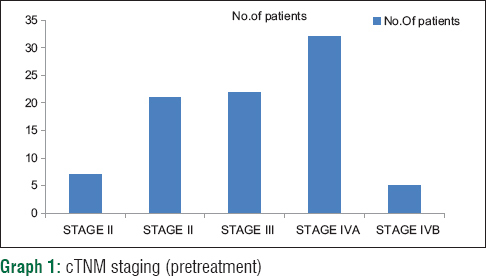 [Table 1] shows preoperative cTNM staging which shows 32 patients were staged in Stage IVA and 5 patients in Stage IVB. This is also shown on [Graph 1]. 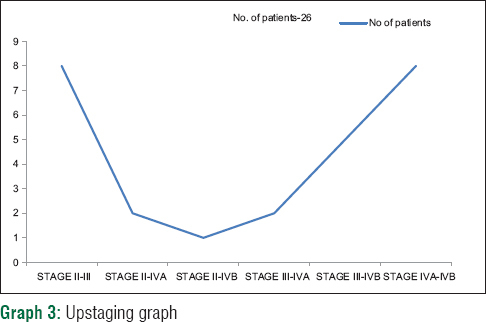 [Table 2] shows postoperative pTNM staging which shows 21 patients were staged in Stage IVB and 29 patients in Stage IVA. When both the tables are compared, there was a upstaging of patients to Stage IVB from 5 patients to 21 patients. This is shown in [Graph 2]. [Table 3] shows number of patients who had upstaging of the disease. Eight patients had upstaged from Stage II to Stage III, eight patients from Stage IVA to IVB, five patients from Stage III–IVB, 2 patients from Stage II–IVA and Stage III–IVA, and one patient from Stage II–IVB. This is shown in [Graph 3]. 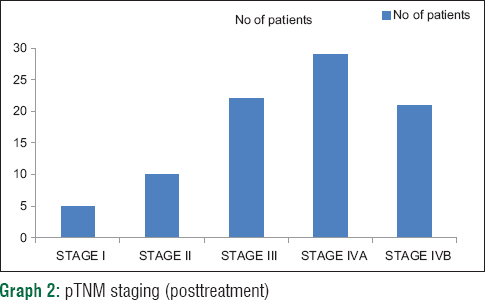 [Table 4] shows various sites of stage migration of 26 patients. Tongue cancers were upstaged more pathologically with 46.15%, then other cancers followed by buccal mucosa cancers with 38.45%. Out of these 26 patients, 11 patients have clinically N0 necks. However, due to their T size, elective radical neck dissections were performed. Histopathological reports show pathologically positive neck with their stage to get upstaged from N0 to N+ necks which have a direct influence on prognosis of the patients. 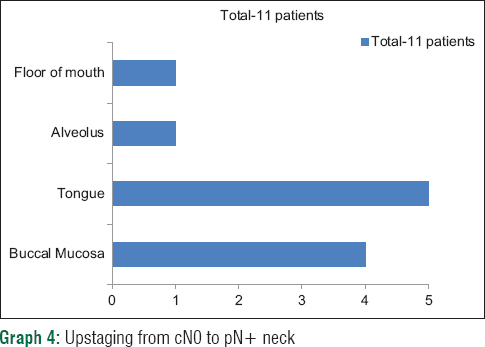 [Graph 4] shows various sites of upstaging from cN0 to pN+ neck in these 11 patients. Tongue was the highest followed by buccal mucosa. These patients received adjuvant radiation of 30# with 6 cycles of cisplatin postoperatively. The present AJCC guidelines stages patients with regional lymphadenopathy at a more advanced stage when compared to patients with N0 neck.,, These guidelines use a system of staging of patients based on data of the clinical examination and radiographic evaluation. Pathological review of the primary specimen and neck dissection specimen has a greater potential of altering or advancing the lymph node stage by revealing occult, additional positive lymph nodes, and extracapsular spread that cannot be identified on routine clinical examination or radiographic evaluation. This change in pathological lymph node staging could alter prognosis and treatment outcome of the patient. Staging systems are designed to compare similarly staged patients treated with various treatment modalities and to determine overall prognosis for individual patients., However, when there is obvious upstaging of the disease, cTNM underestimates the extent of lymph nodal involvement as additional or occult pathologic lymph nodes are identified by pathologic review after elective neck dissection. The relatively high incidence of upstaging of the disease in our study reflects the subjective nature of both clinical palpation of the neck and radiographic imaging in the evaluation of the extent of regional lymph node disease. Previous studies reported a 60–70% clinical accuracy rate for palpation in staging the neck., The reported lower limit of palpability is 0.5 cm in superficial areas and 1 cm in deeper areas. Therefore, occult metastasis and ECS are beyond the scope of clinical evaluation. In a landmark study done by D'Cruz et al., the effect on survival of elective node dissection (ipsilateral neck dissection at the time of the primary surgery) versus therapeutic node dissection (watchful waiting followed by neck dissection for nodal relapse) in 596 patients with lateralized stage T1 or T2 oral squamous cell carcinomas concluded that elective node dissection was superior in most subgroups without significant interactions and increased the disease-free and overall survival rates. Rates of adverse events were 6.6% and 3.6% in the elective surgery group and the therapeutic surgery group, respectively. Radiographic imaging such as computed tomography (CT) scans can be used as an adjunct to physical examination to improve staging accuracy and its sensitivity. Weiss et al. found that the CT scan upstaged the clinically negative neck in 67% of cases of oral cavity and oropharyngeal carcinoma, and several other studies have shown a >90% accuracy rate for CT scanning of pathologic neck disease. Although this may have influenced the incidence of upstaging in our study, since we have used USG – neck considering the financial condition of the patients. The potential influence of upstaging raises the possibility of a staging neck dissection for patients with HNSCC to identify patients who might require or benefit from postoperative adjuvant therapy and allows for improved prognosis with disease-free survival and comparisons between various groups. Although treatment modalities for regional disease include radiation, neck dissection, or observation, only neck dissection offers valuable histologic staging information. Therefore, it remains the current gold standard for assessing the real extent of lymph nodal involvement in both clinically negative and positive neck specimens. In proposing a staging neck dissection for patients with HNSCC, we conclude that treatment of the clinically negative neck is a still an area of controversy. However, treatment of the clinically negative neck by elective neck dissection is warranted when there is a >20% incidence of occult lymph node disease which clinically depends upon the T size and site involved by HNSCC. Pathologic lymph node staging, based on a staging or elective radical neck dissection, should be considered for patients treated for squamous cell carcinoma of oral cavity to identify high-risk patients who may benefit from postoperative adjuvant therapy such as radiation/chemotherapy. Prospective studies in large numbers are still essential to validate these findings before pathologic lymph node staging is also included in the standard TNM staging criteria. Grandi C, Alloisio M, Moglia D, Podrecca S, Sala L, Salvatori P, et al. Prognostic significance of lymphatic spread in head and neck carcinomas: Therapeutic implications. Head Neck Surg 1985;8:67-73. Kalnins IK, Leonard AG, Sako K, Razack MS, Shedd DP. Correlation between prognosis and degree of lymph node involvement in carcinoma of the oral cavity. Am J Surg 1977;134:450-4. Schuller DE, McGuirt WF, McCabe BF, Young D. The prognostic significance of metastatic cervical lymph nodes. Laryngoscope 1980;90:557-70. Snow GB, Annyas AA, van Slooten EA, Bartelink H, Hart AA. Prognostic factors of neck node metastasis. Clin Otolaryngol Allied Sci 1982;7:185-92. Myers JN, Greenberg JS, Mo V, Roberts D. Extracapsular spread. A significant predictor of treatment failure in patients with squamous cell carcinoma of the tongue. Cancer 2001;92:3030-6. Alvi A, Johnson JT. Extracapsular spread in the clinically negative neck (N0): Implications and outcome. Otolaryngol Head Neck Surg 1996;114:65-70. Carter RL, Barr LC, O'Brien CJ, Soo KC, Shaw HJ. Transcapsular spread of metastatic squamous cell carcinoma from cervical lymph nodes. Am J Surg 1985;150:495-9. Johnson JT, Barnes EL, Myers EN, Schramm VL Jr., Borochovitz D, Sigler BA. The extracapsular spread of tumors in cervical node metastasis. Arch Otolaryngol 1981;107:725-9. Johnson JT, Myers EN, Bedetti CD, Barnes EL, Schramm VL Jr., Thearle PB. Cervical lymph node metastases. Incidence and implications of extracapsular carcinoma. Arch Otolaryngol 1985;111:534-7. Brasilino de Carvalho M. Quantitative analysis of the extent of extracapsular invasion and its prognostic significance: A prospective study of 170 cases of carcinoma of the larynx and hypopharynx. Head Neck 1998;20:16-21. Hirabayashi H, Koshii K, Uno K, Ohgaki H, Nakasone Y, Fujisawa T, et al. Extracapsular spread of squamous cell carcinoma in neck lymph nodes: Prognostic factor of laryngeal cancer. Laryngoscope 1991;101:502-6. Snyderman NL, Johnson JT, Schramm VL Jr., Myers EN, Bedetti CD, Thearle P. Extracapsular spread of carcinoma in cervical lymph nodes. Impact upon survival in patients with carcinoma of the supraglottic larynx. Cancer 1985;56:1597-9. Pinsolle J, Pinsolle V, Majoufre C, Duroux S, Demeaux H, Siberchicot F. Prognostic value of histologic findings in neck dissections for squamous cell carcinoma. Arch Otolaryngol Head Neck Surg 1997;123:145-8. Mamelle G, Pampurik J, Luboinski B, Lancar R, Lusinchi A, Bosq J. Lymph node prognostic factors in head and neck squamous cell carcinomas. Am J Surg 1994;168:494-8. Yousem DM, Som PM, Hackney DB, Schwaibold F, Hendrix RA. Central nodal necrosis and extracapsular neoplastic spread in cervical lymph nodes: MR imaging versus CT. Radiology 1992;182:753-9. Don DM, Anzai Y, Lufkin RB, Fu YS, Calcaterra TC. Evaluation of cervical lymph node metastases in squamous cell carcinoma of the head and neck. Laryngoscope 1995;105 (7 Pt 1):669-74. Weiss MH, Harrison LB, Isaacs RS. Use of decision analysis in planning a management strategy for the stage N0 neck. Arch Otolaryngol Head Neck Surg 1994;120:699-702.